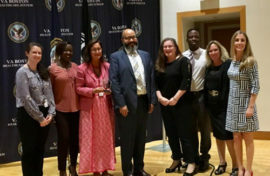 Braintree and Brockton, MA (October 1, 2018) – Howard Apartments, a Veteran’s Supportive Housing community managed by Peabody Properties, a full-service real estate and property management firm, was recognized with a Community Advocate award from the state Department of Veterans Affairs during a recent reception held at the West Roxbury Division. This Community Recognition Reception honored Howard Apartments, a permanent supportive housing community for formerly homeless veterans located on the Brockton VA Medical Center in Brockton. The nomination was put forward by Judith Lipton, Boston HUD-VASH (Department of Housing and Urban Development-Veterans Affairs Supportive Housing) Program Manager; Cheryl Simmons, Brockton VA HUD-VASH Supervisor, and Sheena Calixte, a HUD-VASH Social Worker assigned to Howard Apartments. The VA Boston Healthcare System’s Health Care for Homeless Veterans Program, of which the HUD-VASH Program is the largest, holds a community awards recognition event annually to thank its outstanding partners in the mutual quest to end veteran homelessness.